Friday's market action started out positively, but gains eroded heading into the afternoon. Market pros are waiting to see signs of capitulation that have not emerged yet. Two Bank of America Merrill Lynch gauges showed conflicting signs — one that measured the breadth of global stock trends flashed a buy signal, but the firm's much-followed Bull & Bear Indicator wasn't there yet. 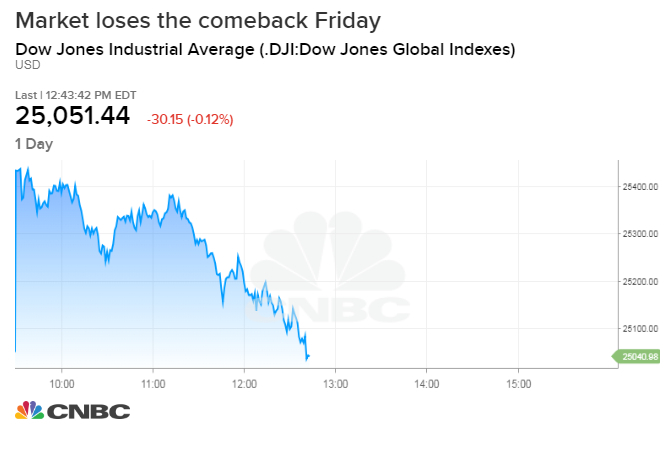 Friday's early morning market rebound helped assuage some of the frayed nerves on Wall Street, but it may be too soon to get comfortable about what happens over the near term. Major averages posted strong gains in the morning session following a volatile week on track to be the market's worst since springtime. As the day wore on, though, the market weakened substantially and gave up those gains. Market veterans pointed to a number of issues that left them uncomfortable and point toward more potential rough times ahead. "Some signs of capitulation are emerging but we think that some more selling is yet to come," Maneesh Deshpande, head of equity derivatives strategy at Barclays, said in a note. One issue that Deshpande sees as troubling is a lack of selling in passive ETFs that have accompanied previous bottoms. In fact, he said, flows over the past few days in equity funds have been modestly positive, indicating that sentiment hasn't turned negative enough yet to indicate that the end of selling is at hand. "The passive fund flows as a sentiment indicator are highly correlated with market returns, which indicates that significant selloffs might be exacerbated by these flows," the Barclays analyst wrote. Dehspande said ETFs took in nearly $1 billion in assets on Wednesday and Thursday. "Thus this class of investors has not capitulated yet." Stocks roared out of the gate Friday, pointing to gains above 1 percent for the Dow industrials. But steady selling through the day eroded much of those gains, and the blue chip average was struggling to hold a 100-point gain as traders started getting ready to head home for the weekend. While the long-term landscape still looks positive and no one was lowering price targets, the short-term indicators didn't appear favorable. Much like Deshpande, BofAML's chief investment strategist, Michael Hartnett, said there weren't enough capitulation signs yet to get comfortable. Hartnett said he's looking for something similar to the February 2016 buy signal that would come from hedge fund selling and repositioning from commodity trading advisors. Similarly, Nick Colas, co-founder of DataTrek Research, said Thursday's market action didn't show the telltale signs of a market bottom. For one, there was no "outsized sell-off" at the open that would indicate a rush to the exits. Second, he was looking for a rally after the first half-hour that didn't happen, rekindling memories of "the dreaded 'margin clerk selloff'" that happened during the 2008 meltdown; and, finally, typical leaders like Boeing and tech didn't step forward to guide the market higher. "Therefore, we don't think US equities have seen their near term lows," Colas wrote in his daily note after Thursday's trading, in which the market saw another sharp down day. "The typical market response to a down 4% day (like Wednesday) is a modest up day in the next session (+1.7% on average). This signals that investors think prices reflect some near term opportunity. That's what happened in early February of this year, for example, and markets found their footing. The fact that today did not follow the traditional day-after pattern worries us." He also pointed out that a large "sell" program hit the market Thursday around 2:30 pm and said traders should keep an eye out for something similar in the coming days. The re-emergence of global stocks and emerging markets provided some hope, but Colas sees the overall landscape in the near term to be troubling. "Our bottom line: the next two days [Friday and Monday] are too fraught with uncertainty to consider increasing portfolio risk," he wrote. "During volatile periods, we stick to a rules-based approach to determine investable bottoms. And [Thursday] broke too many rules."